Picture yourself taking His yoke upon you. What do you see? 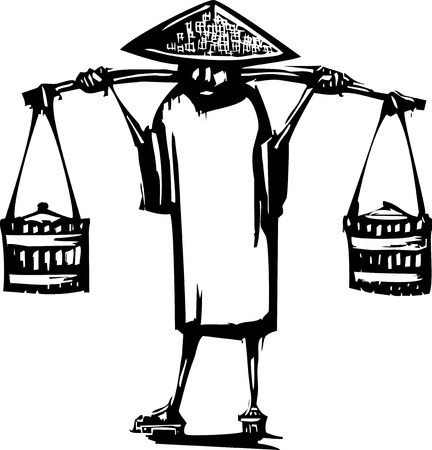 Do you see yourself carrying a balanced burden using a yoke He has designed especially for your body, to enable you to bear your burdens as easily as possible? Is the burden that you carry heavy, but more efficiently borne because of the yoke He has given you to help you carry it? Or do you see yourself harnessed to one side of a double yoke, sharing the burden with the Lord? Alma asked the people he was teaching in the wilderness if they were “willing to bear one another’s burdens, that they may be light.” He told them this was one of the requirements for baptism. Who are we told to emulate in this life? Who is our great Example? Christ, of course. We are counseled to become like Him. If we are to “bear one another’s burdens” as a prerequisite to baptism we must be following Christ’s example in which He bears ours! Why do we hesitate to take His yoke upon us? For some, the culture of self-reliance has become twisted in our minds to the extent that we think it means we have to exhaust every ounce of human strength within our bodies before we can ask for His help. If this is what is holding you back, I would encourage you to watch “His Grace is Sufficient,” an inspiring and informative BYU Devotional talk by Brad Wilcox. Some people are afraid “His yoke” will be heavier than their own; that taking His yoke upon them will add to their existing burden. He promises that if we will take His yoke upon us He will give us rest! 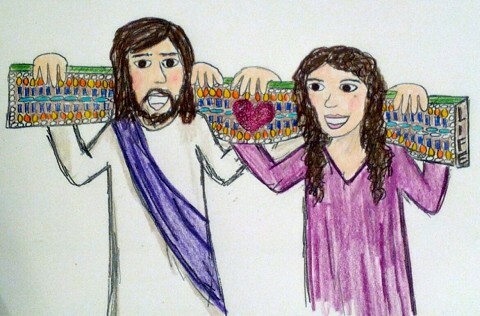 His yoke is lighter than ours because He carries most of the weight. Imagine if you were in a double yoke pulling a heavy cart and the person sharing the yoke with you was a small child. Who would be carrying most of the weight? You, of course. And suppose there was rocky ground and the child lost their footing and was stumbling and struggling to regain it and keep up with you. Would the child’s struggle make it easier or harder for you to pull the load? Harder! When we are sharing a yoke with the Lord, if we come to rocky ground and lose our footing, we make His job more difficult by trying desperately to figure out how to regain our balance for ourselves. During those times, we need to lift our feet and allow Him to carry us to smooth ground and resume our journey. Finally, some are reluctant to be yoked to the Lord because they are not really sure they can trust Him. They are afraid that the direction He will pull or the weight of the load or the speed of the journey will not be what they would choose. They are reluctant to turn their will and their lives over to His care. They think that they are more capable of choosing the best (easiest) path for themselves than He is. Through Malachi the Lord challenges us to “prove me now herewith.” Alma also challenged the people to test the Lord. To you who are not sure you can trust Him, I say, give Him a chance. You can always take back control later if He proves unworthy of your trust. But give Him enough time to get some results before giving up. I challenge you to try taking the Lord’s double yoke upon you. If you have already done so, and the journey still seems harder than it should be, I would encourage you to ask Him how to lift your feet and allow Him to carry you to smoother ground. What burdens are you carrying in your journey? What are you doing to make your journey harder than it needs to be? What will you do today to “take His yoke upon you” as a way to enable Him to make your burden light and grant you rest? Credits: Single yoke image: Copyright: xochicalco / 123RF Stock Photo, Double yoke image. God has created us in His image. He has given us divine potential or “spiritual fruit”: gifts and talents we can discover and develop throughout our lives. Sometimes they are apparent and obvious. From a very young age we can begin to develop and enjoy them. Others are obscured; hidden beneath shortcomings only to be freed and discerned as we become willing to turn to the Lord for help in letting go of and overcoming weakness. Suppose when we are born we each have our very own spiritual fruit tree—let’s say it is an orange tree. Each orange represents a strength, gift or talent. The low-hanging fruit is easy to pick, even for a small child. We must remove the peel which encases the sweet, delicious orange full of vitamins and goodness. That requires some work. As soon as we become aware that it is there, and someone teaches us how to pick and peel it we can eat the spiritual fruit and grow stronger and more capable. A new baby is too weak to roll over or sit up alone. But as loving parents nurture and feed the child s/he grows stronger and through determined effort learns to sit, crawl, walk, run and climb. The capabilities of the miraculous body created for this child develop and strengthen as s/he works at those skills, too young to be afraid of failure or hard work. The youngster develops spiritually as well as physically, developing wonder, faith, gratitude and a sense of sacred awe. At some point, we will have picked and eaten all of the low-hanging fruit, but there is still more on our tree. The higher fruit is more difficult to see and reach. We might need to climb the tree or get a ladder. Climbing, stretching and reaching may be outside of our comfort zone. We may feel scared and off balance. But the Lord holds the ladder and stands beneath the tree prepared to catch us if we fall. 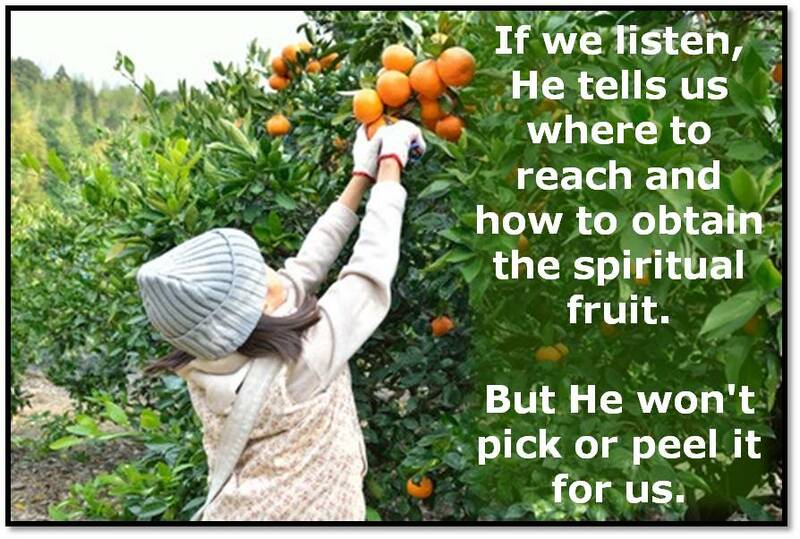 If we listen, He tells us where to reach and how to obtain the spiritual fruit. But He won’t pick or peel it for us. As we mature into adulthood we develop fears and bad habits that keep us from exploring and finding more gifts, talents and strengths. If we focus on the ground and don’t look up at the beautiful tree, we may not even realize there is more fruit. Writing an inventory of our shortcomings and weaknesses helps us spot the spiritual fruit. We may not have any idea what wonderful gift lies within the rough, ugly peel, but we can turn to the Lord for help in becoming willing to do the work necessary to obtain the fruit, remove the shortcoming that encases it, and allow Him to replace the weakness with strength. What spiritual fruit have you already picked? What is stopping you from picking more? What will you do today to spot and reach for more?